30 April 2016 We arrived at Heathrow for our 21:20 flight to Johannesburg but the check-in desk discovered that, although our agent had booked our flights, they hadn't "issued the tickets" (whatever that meant!). We spent an hour on hold with our agent but failed to get through. The member BA check-in staff we spoke to was really helpful - Tammay's gold card allowed us to use first class check-in & the business lounge. We finally realised that we weren't going to be speaking to our agent so simply purchased a pair of new return flights (not sure what someone who couldn't have afforded the extra tickets would have done!). 1 May A day of flights! 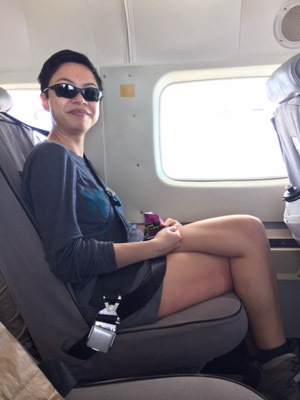 After landing in Johannesburg at about 9am, we transferred onto a flight to Windhoek, and then onto a 12 seat Cessna for the flight to Kulala Desert Lodge. We even had the opportunity to sleep on the roof of our villa while we were there. It gave us a lovely view of the night sky although the background lights from the camp meant astrophotography wasn't easy. 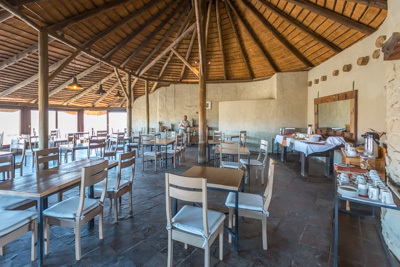 The dining area at Kulala Desert Lodge. 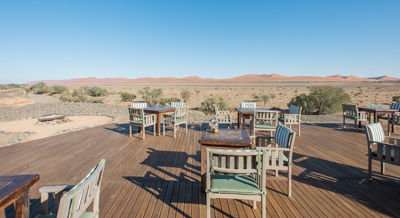 The deck at Kulala Desert Lodge - great for dinner under the stars. After a brief orientation, we went out to watch the sunset from the top of a nearby hill. It was then back to the lodge for dinner under a starry sky. 2 May A 05:00 wake-up call for a 05:30 breakfast and a 06:00 start on the road. We stopped at a few locations on the way, including 'Dune 49'. You are only allowed to climb a few of the dunes. 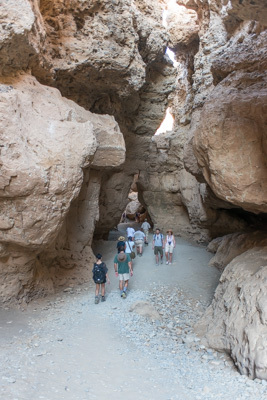 'Dune 45' is the most popular because it's easy to get to and it's a relatively short hike. 'Big Mamma' is another option. We stupidly chose to climb 'Big Daddy', the biggest dune that can only be accessed with a 4x4. Walking on the deep sand was obviously tough going. Despite being close to the top, the lady that Tammay was hiking with started to consider turning back, but they pushed on and made it to the top. 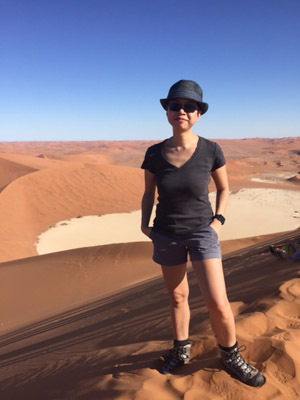 The climb may have taken nearly 2 hours but the decent was less than 2 minutes, running down the other side of the dune onto Deadvlei. 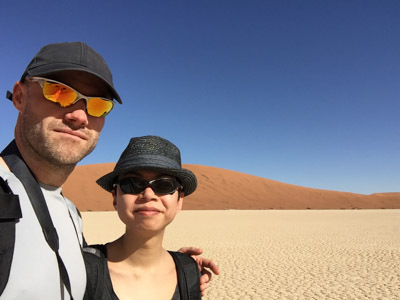 Deadvlei was a really picturesque salt pan with sparsely distributed dead trees. After a few well deserved snacks back at the vehicle we made the short drive to Sossusvlei which was nowhere near as picturesque. That afternoon we went on a short hike along the narrow Seisriem Canyon and had sundowners on top of a hill near the lodge with a lovely view of the sunset. Back to the lodge for a shower and dinner with the group: Anke from London looked a similar age to us but was actually 10 years older; Katie from Hong Kong who was borrowing her brother's D800E and an American couple who were visiting their son (who had recently graduated and was part way through a 1 year placement teaching science in Northern Namibia). The conversation varied from running 10km in North Korea, to Fox News and gun laws in the US - all quite lively topics when they include Tammay and a gun toting American Republican! 3 May Another 05:00 wake-up for a sunrise hot air balloon trip over the sand dunes. It was a surprisingly sedate way to start the day. 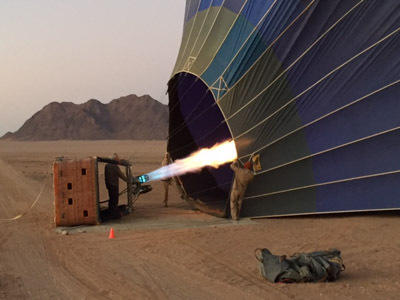 The balloon held 16 people and we got as high as 400m. The views were pretty stunning. The landing was a little more interesting. We all had to crouch down into the basket as it bounced along the ground before keeled over and finally coming to a stop (which we were told was know as a 'sporty landing'), leaving us all on our backs inside the basket. 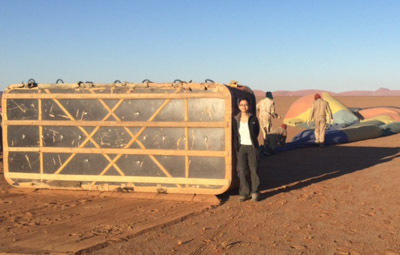 We had planned to go quad-biking straight after the ballooning but the thought of an extra couple of hours in bed was too appealing. That afternoon we took a walking safari away from the lodge along the dried river bed. After mentioning to Joas that we had flashlights with us (our iPhone) he seemed to extend the walk until well after sunset. 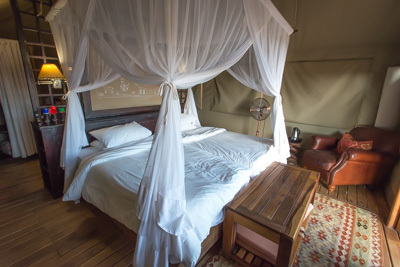 4 May Our last day at Kulala Desert Lodge and a welcome lie in since our flight North wasn't due to take off until 09:10. After arriving at Geluk airstrip we watched as a small 4 seat plane landed shortly followed by a larger 14 seat one. We were initially informed that we'd be on the smaller of the two, which given the very blustery conditions was likely to mean a turbulent flight, but thankfully that wasn't the case. 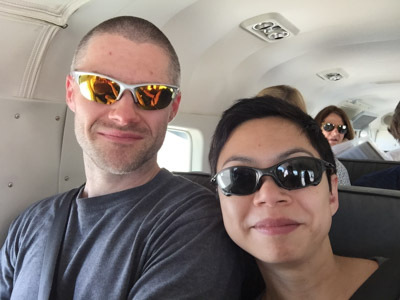 Our pilot did a great job, taking us on a route along the valley, over Deadvlei & Big Daddy, then out to the coast. As we travelled up the coast the pilot flew at 500 feet giving us great views of some of the seal colonies, the famous Eduard Bohlen and Shaunee ship wreaks, and an abandoned diamond 'mining' camp (where men linked arms and scoured the surface of the sand for diamonds lying at the surface). 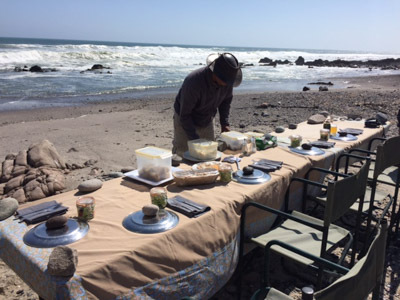 We landed in Swakopmund to drop of 3 German passengers and re-fuel before heading further North, alongside Brandberg Mountain (which, at 7500 feet, is the tallest in Namibia), and on to Doro Nawas. 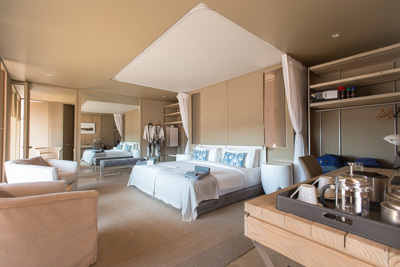 From there it was a 10 minute flight to Damaraland Camp. 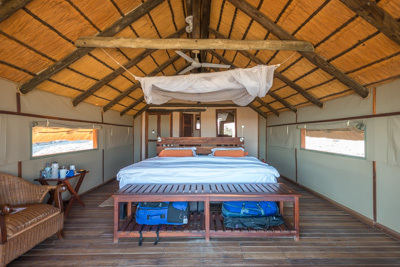 Our room at Damaraland Camp was very comfortable. We had lunch around the large dining table and chatted with Peter & Gisele and Russ & Jo. Chris, our new guide, took us on a late afternoon hike along the Shephard's Trail which took us into the hills around the camp. After returning, we had a big group dinner under the stars around a bomas (traditional fire). After dinner our guide took us out from the dining area towards the toilets using a UV torch to 'illuminate;' the path. The torch obviously didn't illuminate the ground but when we came across this scorpion on the path it was glowing very brightly. A very good reason not to wear flip-flops! May 5 Another 05:00 wake-up for a 05:45 start. The camp had set up breakfast on top of a nearby hill, which was impressive given it included a fully laid table and bacon & eggs! After breakfast we headed towards Doro Nowas where a herd of desert elephants had been spotted. This took over an hour of driving over rough terrain and along a dry riverbed. Chris stopped to point out a lot of different vegetation and animals along the way. 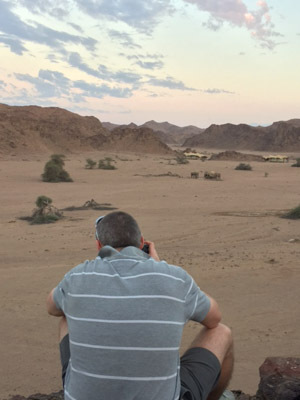 We saw a lot of different birds and springbok. After the long drive we finally came across a lone bull elephant happily eating under a tree. We didn't have to go too much further to find the herd, which included a 4 month old baby and a 2 year old toddler. Both seemed very happy just lying around on the cool ground as the adults ate around them. We watched the herd for quite a while before making the journey back towards camp. 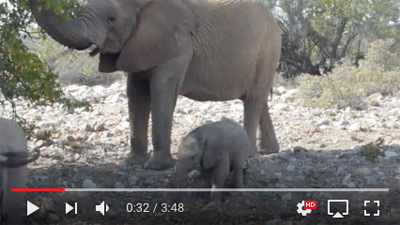 Tammay managed to record some video footage of the baby elephant along with other things from our trip. After lunch and a mid afternoon nap, we took a tour of a local farm/village called Fonteine. A young lad called Reginald showed us around the farm. He was attending school in Swakopmund (hoping to be a doctor one day) and was visiting his grandparents during the holidays. This was the small reservoir on the property. 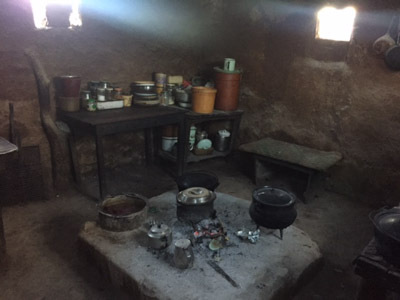 The inside of the family home was quite primitive. But they did have a tortoise shell cat with similar markings to Mollie! Reginald's grandfather also gave us an interesting talk about how he helped set up the local conservancy and how they worked with the camps in the region to ensure that jobs went to the locals first. 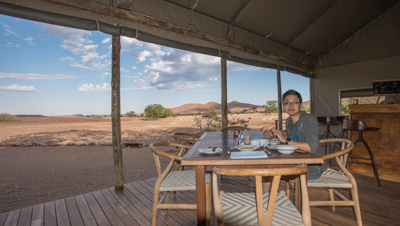 May 6 A late breakfast before our 10 minute flight from Damaraland to Doro Nawas where we changed planes (and I managed to get stung by a bee) for our onward flight to Hoanib (strangely another bee followed us into the cabin but Tammay managed to swat it!). Charles, our new guide picked us up from the air strip for the short drive to the camp. We were greeted by a perfectly nice but rather eccentric man called Clement, who might have spent a bit too long under the Namibian desert sun! 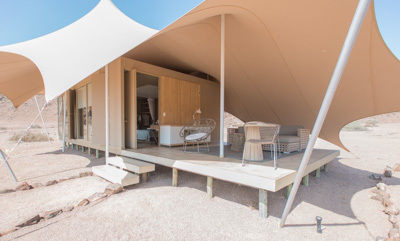 The Hoanib Skeleton Coast Camp was very nice with ultra modern rooms more suited to a New York hotel (but still no wifi though!). After lunch and a lie down we walked across the small plain in front of the lodge and to the top of a hill overlooking a very dry Hoanib River. We sat and watched as the sun set. May 7 Elephant day! 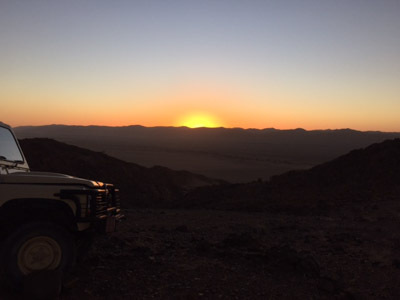 We left camp a little after 07:00 and headed for the Hoanib River bed. Charles quickly spotted multiple elephant tracks travelling in both directions. We travelled East to a watering hole to get a better idea of their direction of travel. Along the way Charles spotted a fresh elephant track with an even fresher hyena print over the top giving him a firm idea of where they'd gone. We travelled further along the river, coming across a pair of giraffe, steenbok and oryx. A little further and we reached the elephant herd - 3 cows, 3 youngsters and 2 bulls. We followed them along the riverbed for quite some time as they "browsed". 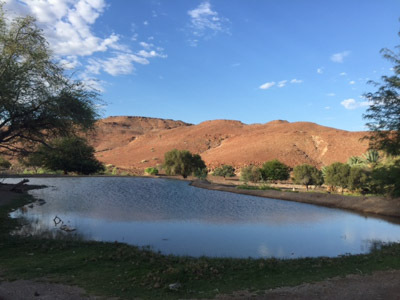 We then went back to the watering hole where we saw a family of ostriches, which included 4 little chicks (just a few weeks old!). As we approached, they headed in the opposite direction, their age certainly didn't slow them down! We stopped at the top of a bank, with a view of the plain and watering hole below. We took a short break for the usual coffee and biscuits. We decided to head back up the river and follow the elephants to the watering hole. Unfortunately they must have drank sufficiently earlier that morning as they were in no rush to get back to water and continued to browse. That afternoon, we made our way back to the river for a short drive and sun downers but Charles spotted fresh elephant tracks. We followed them and quickly came across the area's other herd of elephants. Sun downers were quickly cancelled and we followed the herd, this one with a 3.5 month old calf! They were moving back towards our camp at quite a pace, clearly needing water, so we drove ahead of them to find a prime vantage point on the river bank. As they approached, we ditched the jeep and scrambled to the top of the steep bank. The herd passed on the riverbed below. The calf trumpeted while one of the cows stared up at us. As they climbed the bank at the same point as us we made a bee-line for a large rock on the plain in the direction of the water hole. Our new vantage point gave us a great view as the whole herd passed. They stared up at us, clearly aware of our presence, but they weren't put off - they didn't change their path or miss a step. As the herd headed up the plain to the water hole we crossed it to reach the foot of the mountains on the other side and again climbed to the top of a small rock outcrop. It gave us a great view of the herd while they were drinking. The camp, and in particular our room, was directly behind them. As the sun set I took a few more snaps. After they had had their fill, they started making their way back towards the river bed until one of the elephants found a loose water pipe on the ground. They all started trying to pull the length out of the ground, all rather amusing until we realised we might be stuck on the rock all night! After getting a fair amount of it out of the ground they finally gave up and left the camp. By this point it was already quite dark so we turned on our torches and returned to camp. Poor Charles still had to go and find the jeep but when he got there, the herd was apparently standing right next to it, so he had to do a tactical jump from one jeep to another. May 8 An early start for our trip to the coast and Skeleton National Park. 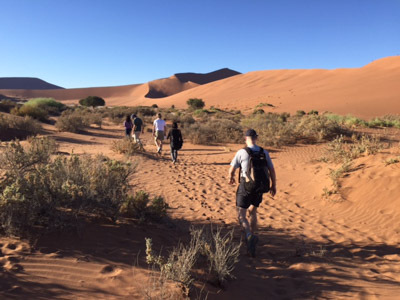 We left the camp at 05:30 and started our journey along the dry Hoanib River bed. Almost straight away we came across a cheetah with her two cubs (approx 2 months old - still looking like part honey badger) retreating from a springbok kill. We followed them around a bend in the river, where we had a great view of them climbing the bank, before getting out of the vehicle and following on foot. By the time we reached the top of the bank they were already at quite a distance. We were able to see the cheetah and her cubs in the distance but they were already too far to follow. We got back in the vehicle and headed back up the river where we found two jackals feasting on the carcass with a third keeping look out. We got back onto the river bed and continued on our journey. As we reached the plains we spotted leopard tracks in the sand but there was little hope of us actually finding the animal in the grass. A little further along Tammay and I both spotted a caracal crossing an open area - the first time we'd seen one and the first time one had been spotted at the camp this year. As we approached the coast line the deeper sand of the dunes made for a welcome change - driving at speed with no bumps! Charles drove to the top of a dune and parked up. 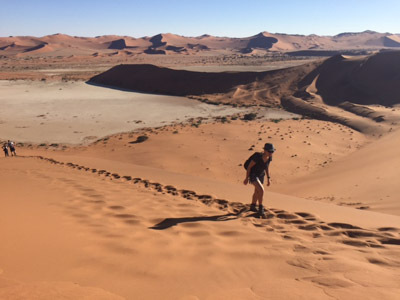 He got us all to sit on the edge of the dune and slide down - the friction of various layers of sand flowing around us caused a reverberation which was said to sound like a 'lion in the dune'. Once we reached the coastline we first drove South to a colony of flamingos, and then North to a colony of seals. After visiting a little museum in Mowe Bay Village, where the park ranger lives, we drove a short distance to the Suiderkus ship wreak (1978). This was a little disappointing in comparison to the other shipwrecks we had seen from a distance, as the ship was basically unrecognisable, but it was followed by a lovely lunch on the beach. Rather than driving back to Hoanib we took a scenic flight. Although perfectly nice it turned out to be rather less scenic than our earlier flight from Geluk to Swakopmund. That afternoon we listened to a presentation on bats from a PhD student then watched the 'Vanishing Kings' documentary with popcorn and cake! May 9 Our last day at Hoanib and a relatively quiet day. We went on a short drive before our flight and once again spotted Arnold and Charlie (2 bulls from the first herd we'd encountered) browsing along the dry Hoanib River bed. We also spotted some giraffe and baboons. 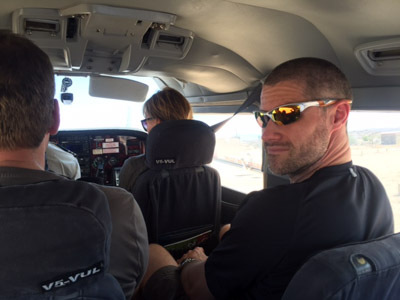 We took two flights, firstly from Hoanib to Doro Nawas, and then on to Desert Rhino Camp. Upon arrival at the camp we had a light lunch and met Herunga our guide (it was his first week at the camp having just transferred from another company). 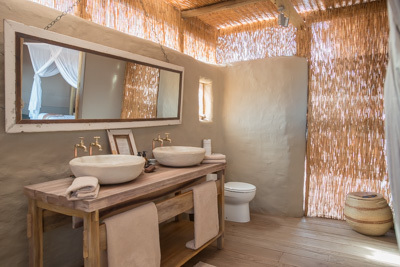 Rooms at Desert Rhino Camp, while being more basic than the other camps, were still serviceable. 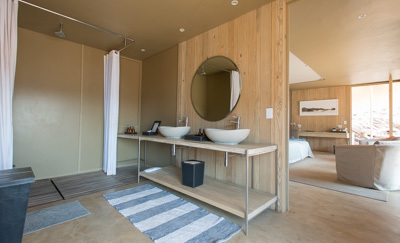 The common areas of the camp were also more basic than the other camps and it felt like they were in need of some improvements. We had a short evening drive and spotted a hyena whilst on foot just a short distance from camp. 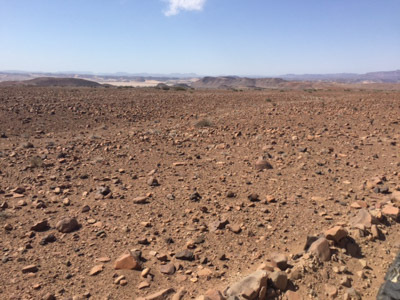 We were struck with how much the Namibian desert resembled the surface of Mars. We watched the sun set but I came down with another fever while we were out so went straight to bed when we returned to camp. Tammay joined the rest of the group for another traditional 'surprise' boma dinner (but brought me another tuna sandwich which was exactly what I needed around 22:00!). May 10 Three rangers from the Save the Rhino Trust left the camp very early in the morning to track down one of the rhinos - doing all the hard work for us! The area around camp is split into four zones and the trust rotates the zone they use for trekking. Luckily we were scheduled to visit a nearby zone which only needed a 05:00 wake up call! After only about an hour of driving we reached the trackers who were now out on foot, searching for the rhino. It wasn't long before we were also on foot and heading to a spot near to where the rhino had been seen. Surprisingly the trackers had actually found two rhinos - a local male named "Don't Worry" and a female from a different area that had travelled to find a mate. We spent about 20 minutes with them before making our way back for lunch under some trees near the camp. That evening we went out for a short sunset drive. Although we didn't see a great deal of wildlife, we were fortunate to be able to watch the sun set over the spectacular landscape. May 11 Our last day in Namibia. 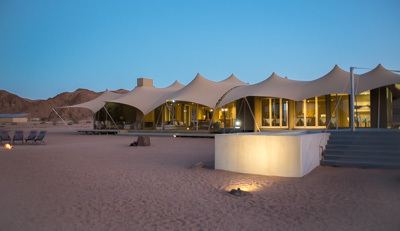 As we ate breakfast at the Desert Rhino Camp two spotted hyenas came to investigate. We took a 'scenic' route to the airport but unsurprisingly didn't see any animals. 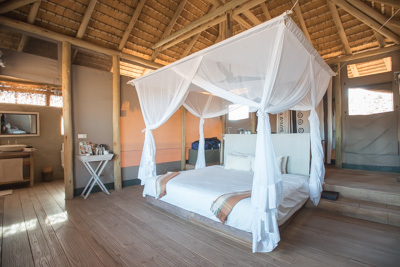 We flew from Desert Rhino Camp to Doro Nawas where we increased our wasp kill count to 5. After about an hour's wait it was on to Windhoek where we connected with our international flight to Johannesburg and the remainder of our trip in South Africa.